Non-Repainting Indicator that is based on combined angular momentum of price levels using configured period as main reference. It is sensitive to the change of angular momentum on lower periods. You can use this indicator on any time frame without the need to configure any moving average period. Alert - Set alert to true if you want to be notified by MT4 platform for each new change in angular momentum direction. Notification - Set notification to true if you want the notification to be sent to MT4 mobile app. Period - Set the period in consideration for the general direction of the trend. When you see a Yellow Line, wait for the blue line to go to the lowest point and trade only when it is moving back up. When you see the Yellow Line is changed to Red Line, you should attempt to close your trades that are on the wrong direction of the market soon. When you see a Red Line, wait for the blue line to go to the highest point and trade only when it is moving back down. When you see the Red Line is changed to Yellow Line, you should attempt to close your trades that are on the wrong direction of the market soon. 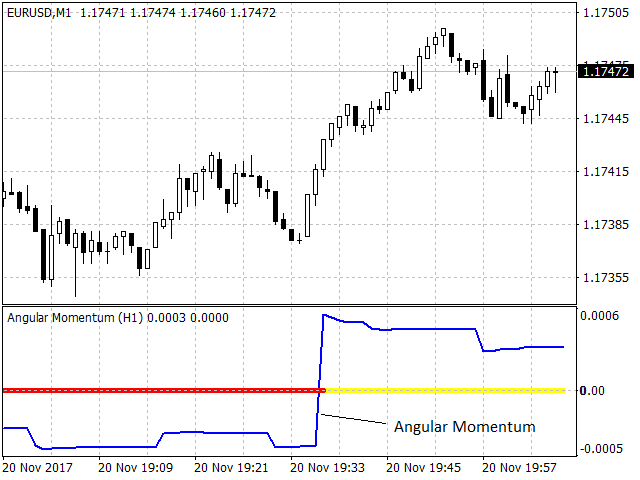 Place 2 angular momentum indicators with H1 and H4 on your chart to trade existing trends. [AM][Symbol][Period] - It is the general direction of the trend (1 is bullish trend, -1 is bearish trend). Spikes and Trend Quality features are removed, as they will no longer be supported. Making finding the "Trend Quality" label easier when setting Label Auto-Repositioning to false. 1) Fix: Indicator color, width and style can now be changed and not be reset to their default values. 2) A new setting, Label Auto-Repositioning, can be set to false so that the trend quality label can be moved manually to any position. The trend quality is now shown all the time. It can be found between the angular momentum line and zero level. There is now a new better looking logo. Data Window: "Up" and "Down" are renamed to "Up Line" and "Down Line". Data Window: "Up Signal" and "Down Signal" are renamed to "Up Spike" and "Down Spike". Alert Message is now "Angular Momentum (<Period>) - Long/Short <Symbol>", instead of "<Symbol> (<Period>): Buy/Sell"
Included a new feature, "trend quality" shown at first bar. It indicates the number of consecutive price spikes of same colour within the look-back period. Bug fix for Divide by Zero error when computing ZigZag angle. 1) Bug fix for "lag of 1 bar". 2) New global variable added [AM][Symbol][Period]. 1) Allow configuration of any period from M1 to MN1, so that it can also take the configured period as the main reference. In this way, position traders can use this indicator as well. 2) Notification alert is included. 3) Alert and notification will only be sent if they are uniquely different from the previous signals.